How do I access a translation other than the King James Version? Verse reference not found! What happened? Where can I find the Expanded Bible Comments? What does the gray shading in the Expanded Bible Comments mean? What does the gray shading in the Harvest Gleanings mean? Why do some Scripture references bring up a translation other than the Standard version (KJV)? Once I am in another translation, how do I get back to the Standard version (KJV)? 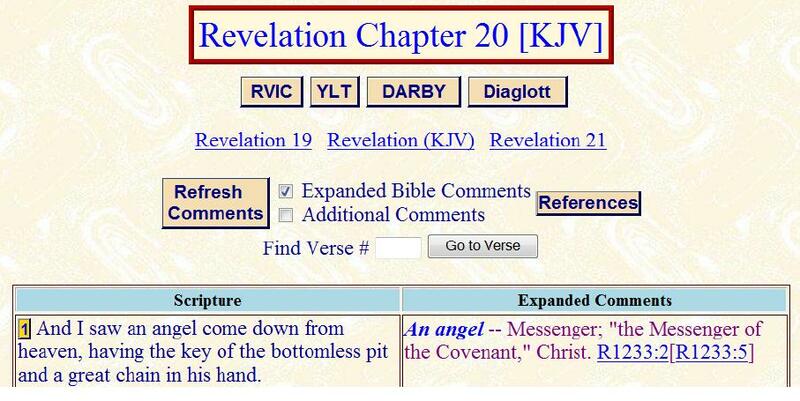 An angel – Messenger; "the Messenger of the Covenant," Christ. R1233:2[R1233:5]. What is the difference between these references? How do I find out about upcoming Bible Student Conventions? <!- Questions and Answers -> How do I access a translation other than the King James Version? In order to do this you need to be in a bible chapter. Click the navigation button "Bible (with comments)." This brings you to the Bible Index page showing all the books of the bible. Click on the name of the book you want. You will then be presented with the chapter index for that book. Click on the chapter you want. This will bring you into the bible chapter. At the top of the page you will find the Book Name, chapter and [in brackets] the Translation. Immediately below that you will find buttons indicating the other available translations. Click on the one you want. *Note* – For translations that are only New Testament, the other books are still listed on the Bible Index page. If you click on an Old Testament book it will still present all chapters of that book to you, however if you then click on any chapter of that book you will receive the error "[bible book] does not exist." Verse reference not found! – I was looking at Scripture References for John 15:5 and clicked on R4163:196. While it did take me to R4163, there was nothing in the paragraph I was taken to that had anything to do with John 15:5. In fact there were no scripture references in that paragraph at all. What happened? If you look carefully at the reference you were taken to you will see it is at the very end of the page. The very last paragraph contains the John 15:5 reference. This only happens when the paragraph reference is at the very bottom or near the very top of an internet page. 2. Near the top of the page you will see the "Refresh Comments" button and two checkboxes next to it. Click the "Expanded Bible Comments" checkbox and then click the "Refresh Comments" button. To go back to the previous view, click the "Expanded Bible Comments" checkbox so that it is un-checked (no check mark in the small square) and click the "Refresh Comments" button again. Why do some of the Expanded Bible Comments have a gray shading while most do not. What does this shading mean? – see Rev. 11:7. This is intended as a safeguard. Normally in the Expanded Bible Comments, when the comment is NOT from Pastor Russell there is an asterisk by the reference. However, some of the comments are taken from the book "The Three Worlds." This book was co-authored by Pastor Russell and N.H. Barbour. Upon examination (and noting the style of writing) it is clear that most of the work is actually written by Barbour. When we remember the course that Barbour took in opposition to the truth (R5909,) coupled with Pastor Russell's own advice that this work be not handed out (R5909), it seems clear that the brethren should have some way of identifying that which is not his work and may not reflect his thinking on the given reference. This is most prominent in the Revelation references. This does not mean that all such references are incorrect. It is simply a way for the brethren to have a "heads up" when considering these comments. There are also some comments where the reference is to the Russell-Eaton or Russell-White debates and the comment taken is from Eaton or White, who were taking the opposite position from Brother Russell. Clearly this is something to watch for as well. In these cases, if you click on the reference, it takes you to the appropriate Harvest Gleanings page and you will note that the background is gray. [Please see the last comment on 1 Peter 1:5 for an example.] We have attempted to do this for all the debates so that none will fall into the mistake of thinking that these remarks are from Pastor Russell. This shading is found in the Russell-Eaton and Russell-White debates. The shading indicates Mr. Eaton or Mr. White is speaking. This has been done because we found some of the Expanded Bible Comments were taken from Eaton or White and yet they are mistakenly presented as coming from Br. Russell. This shading should help the brethren to avoid this mistake. Normally the reason is that the Brother Russell mentioned it or it is being used as part of a topical study. For example see R835 and click on the scripture reference for 2 Pet. 2:1. 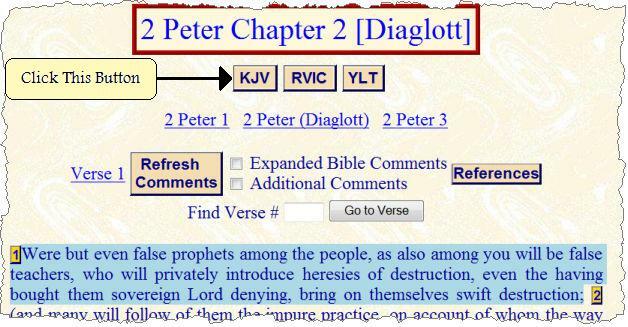 As you can see this is the Diaglott interlinear and not the Standard (KJV) translation. Whatever translation has been selected remains as the default translation until another one is selected. Simply click the KJV button at the top of the page. You will notice that you are now looking at the Standard (KJV) translation. Then when you can use your browser's navigation 'back' arrow (button) as many times as needed to get back to where you came from. – Atlernatively you can use one of the navigation buttons on the left panel. The first is a link that takes you to the beginning of the Reprint page indicated, in this case, R1233. From there you are left to find the reference for yourself. The reason for this is that the references (in this case R1233:2) do NOT refer to paragraphs but to reprint page sections. There is no way to determine what the reference is without searching for it and then modifying the reference to point to the correct paragraph. The bracketed reference (in this case: [R1233:5]) is (as best we can determine) the actual reference. It has been looked up and added for your convenience. Whenever you see a reference in brackets it should take you directly to the desired paragraph. Additionally the comment (as closely as we can determine) will likely be hiligthed in some fashion. Currently the bracketed references are found mainly in the book of Revelation. This is because our class has been in a study of that book and we have therefore made an attempt to include more of the specific references with a view to enhancing the study experience.